What is the Photographer’s Oil Collective? The Photographer’s Oil Collective (POC) is a collaboration between professional photographers and world-class oil painters who are specially trained to reproduce your photographs as museum-quality oil paintings. We primarily serve professional photographers, allowing them to build new capabilities into their businesses. But we also work with enthusiasts on a space-available basis. Our studio is located in Xiamen, China. Our administrative team is in Dubai, U.A.E. Xiamen is a world leader in the commercial oil painting industry. There are more than 5,000 painters working in the city. As such, Xiamen represents one of the largest pools of artistic talent in the world. How did you choose your painters? We researched and vetted the very best painters from among the thousands of painters working in Xiamen. Then trained the painters to better meet the requirements of professional photographers. Finally, we repeatedly commissioned paintings over a period of several years, allowing the artists to develop their new skills to better collaborate with photographers. How many painters do you have? At present, we have four painters. Our standards are high, but we are always searching for new painters who can meet the bar. If we reach output capacity, we will close the POC to new members to maintain both quality and delivery times. We will not sacrifice quality for scale. What is experience level of your painters? Our painters average nearly 20 years professional experience. Can I choose my painter? Initially, our art director chooses your painter based both on scheduling needs and which painter is best suited for your project. However, the option for working with a single painter is available for repeat customers, to allow long-term partnerships for better continuity. Can I work with your painters directly? Our painters work exclusively through POC. Our director in Xiamen is fluent in both English and Mandarin, which ensures that your requests and feedback are well understood by your painter. How are the painters compensated? Our goal is to produce the best quality reproduction paintings in the world. We view our painters as crucial and respected partners to that goal. Our pay scale allows us to both hire and retain the best artists from among the thousands of painters in Xiamen. Additionally, we offer significant annual bonuses based on client feedback. Our painters are extremely happy, both artistically and financially, to be working with POC. This is a life-changing partnership. Where do the painters work? In China, a high value is placed on family life. Given the chance, most people there will choose to work in a family environment. Thus, our artists generally work in their homes. In fact, POC painter George Wen has a seven-year-old son who has already shown a talent for painting. We think that is fantastic and would be thrilled if one day he were to become our first second-generation painter. Can you describe the painting process? Our paintings are oil-on-canvas, and are 100% individually hand-created by your signed artist. There are no photomechanical processes employed. 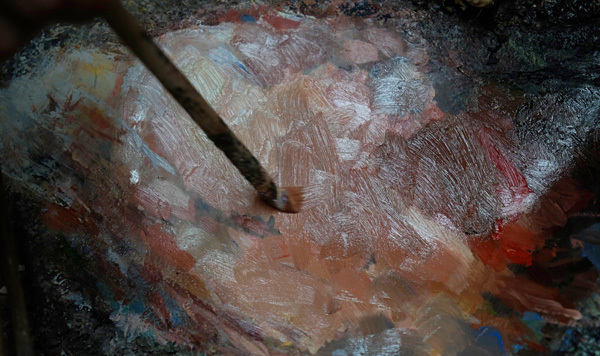 A typical painting has five to six full layers of oil, for color depth and luminance. Please see here for more detailed info. Will this be an exact reproduction of my photograph? No. Oil has a different gamut and color depth than does digital photography. Also, painting is an organic, human process designed to create the optimum piece of artwork possible from your image. For more detail, please see here. Do you use varnish on your paintings? No, for a couple of reasons. First, the use of varnish over oil is a mixed bag. Some painters will choose to use varnish, largely for its protective qualities. But others will choose bare paint, as a layer of varnish over oil creates a non-homogenous laminate than can increase the odds of cracking over extended time. So there are advantages and disadvantages in using varnish. Second, varnish is best applied after long drying times — up to one year. So if a customer chooses to varnish, this can be done locally at any time after drying is complete. You should plan for four to five months. We generally can beat that time. But this allowance offers breathing room for external factors, such as complex subjects or Chinese New Year holiday periods, for instance. Why do they take that long? No. We ship them tubed, padded and boxed, as this is the safest form in which to transport them. Also, framing is a subjective choice best left to the end client. We strongly suggest using a framer who is experienced in stretching and framing paintings, rather than merely framing photos. One should anticipate budgeting approximately USD$350 for stretching and framing for a 16×20″ painting, for example. But the cost will vary depending on your location and the frame chosen. What size paintings do you offer? Our paintings start at 16×20″ class, based on square inches. For example, an 18×18″ square painting would be 16×20″ class. They are available up to 48×72″ class. Can I do group photos, such as family portraits? What subject matter do you paint? We specialize in portraiture. We do not paint landscapes, still lifes or pets, for example. Tasteful nudes (i.e., art nudes or boudoir photography) are permitted, but the painters have the final say on any content that they may consider to be over the line. Our pricing is based on size and complexity, the latter generally relating to the number of people in the painting. Up to two people (subjects) in a painting are included in the base price. Additional people require extra work, and are priced accordingly. Please see here for detailed rates. Why are paintings with more people more expensive? Faces (and to a lesser degree, hands) require great detail and demand more time and attention than other areas in the painting. For that reason we include up to two people in the base price, with additional people incurring extra charges commensurate with the extra time and attention. Why are larger paintings more expensive? A larger canvas allows more detail and takes more time to complete than do smaller canvases. For some compositions (family portraits, for example), larger canvases are required simply to create the space for the necessary amount of detail. This is a time-intensive process. The surcharge helps to cover the extra time involved. How do I order a painting? You can place an order here. But please make sure you have read through the site material first, to ensure the best result. When are orders submitted as commissions? Orders are accepted and finalized from Monday to Thursday each week. (In Dubai the weekend is on Friday and Saturday.) On Sunday the previous week’s commissions are submitted to our studio in China, where they are each assigned to specific artists. You are then notified both of the commission’s acceptance and of the artist to whom it has been assigned. Payment is 50% upon commission, 50% upon completion. The first 50% is due when you submit a project for commission. The final 50% is due upon approval of your painting before shipment. We currently accept major credit cards and PayPal. Payment is in U.S. dollars. Who owns the image rights to the painting? A simple question without a simple answer. Copyright protects the expression of an idea, not the idea itself. The original photographic image is yours, and you continue to own the copyright to that expression of your idea. In theory, the painter should own copyright to the newly painted expression of your idea. But inherently, your painting is a collaborative process and the second version could not exist without the first. So we embrace a shared ownership of usage rights. You own and obviously may sell the actual physical painting to an end client. Further, you also may use images of the painting promotionally on your website, social media, portfolio, brochure, etc., to show your capabilities. Likewise, the painters and POC may do so as well. We will never use your photographic image other than to demonstrate that it was the reference for an attached painting, i.e., to show our capabilities. We are photographers. We respect intellectual property rights, and the rights of our fellow photographers. What about additional usages by third parties? We understand that there may be additional opportunities that result from the creation of your painting, and images of it. We grant, automatically, the rights for reproduction of the painting to be used editorially, (i.e., a stylized magazine cover) or for personal promotion (i.e., a new spin on a publicity photo, avatar, etc.) at your discretion. Commercial and advertising rights are not automatically granted, and you should inquire about any additional licensing that may be involved for those usages. For instance, if you are going to use a POC painting for a national billboard campaign, we should talk first. This is merely to protect against a situation that might take commercial advantage of our painters. In short, we respect the rights of creatives on both sides of the process. How do I credit a painting? Whose image is this? Are there special benefits for volume and/or repeat customers? Among other things, we offer scheduling priority and the ability to partner with a single painter for those photographers who become regular customers. This happens automatically upon receipt of your third commission. Details are made available at that time. Do you have advice about planning various business models that can be built on top of POC? You’ll find a wide-ranging discussion that should help to spark your own business model ideas linked as a download within this page. Also included in the download is a selection of high-resolution images of previous work by our painters, suitable for showing to potential clients. And we plan to continue to expand our peripheral education over time. How do I know I’ll be happy? We’ll work with you every step of the way. You’ll see and approve a photograph of your painting before it ships. If you require changes, they will be addressed before the painting is shipped. We have designed POC to remove much of the risk from the traditional process of commissioning a painting. We want you to be happy and worry-free. What if I am not happy with the physical painting? We will work together to fix things. We are here for photographers. We want you to be happy. During our private beta period, we are limiting public inquiries. Our availability will of course change after we fully launch. Thank you.